10 Amazing Toe Rings To Keep In Your Collection! Toe rings, a perfect item to wear on your feet for the season of summer. Showing of your bare feet with a little piece of bling on it will give you more confidence and you will feel gorgeous! Toe rings can be found in different designs and types. It depends on your choice that which type you want to wear. To get a simple toe ring, you can choose a simple linear shape or a rhinestone on top of it. If you are looking for something in simple designs, you will get them in cheap price. You can also make some by yourself at home by using wires like a diy project. This will be more interesting because you will be able to make it in any design you want. To buy one from your local stores, you will get them in rhinestones, silver, metals and many more. Those who are animal lovers, they can go for the animal shaped toe rings. You can try on the tor rings on any of your fingers and check out how they look. Though it would be best to wear the toe ring on a toe or the finger next to it but it depends on you on which finger you want to wear it. If you are looking forward to buy one from online stores, you will get heaps of varieties because there are actually more options to find on online stores. You will get these toe rings in different materials and types along with colors. If you don’t prefer colors then you can just choose the ones in silver or metals. But if you want colors, there are lots of designs where you will get charms and beads attached to the rings. For example, you can get one with colorful beads attached in it and match a finger ring to go with it. 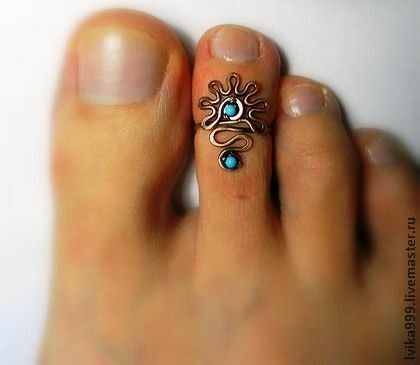 You can also wear more than one toe ring which will look really beautiful on your feet. You can buy the ones with beads from online or local stores. But you can also make one at home by buying the required materials from your nearest craft store. To make a toe ring, you have to select the design at first. Choose what material you want and what will be the design on it. You can make the wired ones which will be really easy to make a simple design or you can go for the beads and charms where you will need a string to add all the things and lock it. To get a wired toe ring, you will need the required amount of wire. You can use pliers to make the angles on the wire. Measure the amount you need by placing it around your finger and then make the required design in the specific area. You can make a knot with the wire which will be a nice design to place on your toe. You can make chevron or round shapes. Use your imagination to get a creative design. If you are making one with beads and charms then you will need the required amount of string. Next, you will need to place the beads and charms one by one into the string. You can attach the end by tying a knot or you can use a mini clasp to keep it secured. In this way you can change the charms or beads anytime you want. As these toe rings are really easy to make, you can also make a few more so that you can wear them together or match the colors whenever you need. You can also make matching anklets to wear with these rings. If you are wearing these toe rings or anklets, try to wear a maxi skirt or shorts so that your feet a bare open to show of these adorable accessories. Have you selected any toe ring for yourself? Which one did you like most?